Henricus (Han) Antonius van Meegeren was born in Deventer in the Netherlands in 1889. He began studying architecture but gave that up to become an artist. My paintings will become original Vermeers once more. I produced them not for money but for art’s sake. Whilst he had some success painting portraits for the upper classes in a style similar to Rembrandt he was criticised by his peers for being unoriginal. So in 1932 Van Meegeren concocted a plan to get revenge on his critics. He would create a ‘new’ and ‘original’ work by the great artist Johannes Vermeer. Once the painting had been accepted by leading scholars and admired by the world he would announce that it was a hoax. 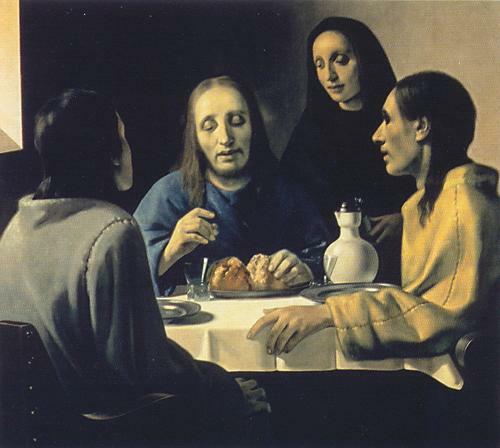 Van Meegeren set to work in the South of France creating ‘Supper at Emmaus’, long considered to be Vermeer’s finest work. Van Meegeren knew the picture would have to withstand tests if it was to be accepted as genuine. He made sure he used a genuine 17th Century canvas and 17th Century pigments. To this he added Bakelite which when baked in the oven made the paint dry rock hard. This gave the impression that it was hundreds of years old. The painting was proclaimed a masterpiece by the leading authority. In 1937 it was purchased by the prestigious Boijmans Gallery in Rotterdam. It became the shining star in the gallery’s latest exhibition “400 Years of European Art”. However when the time came to denounce it as a fake, Van Meegeren changed his mind. Within a month he was working on another forgery. Over the next few years he created six more ‘Vermeers’ as well as countless other paintings by Dutch Old Masters. The pictures made him a vast fortune but with the money came alcohol and drug addictions. Despite his problems Van Meegeren’s forgeries continued to be accepted as the real thing until 1945. 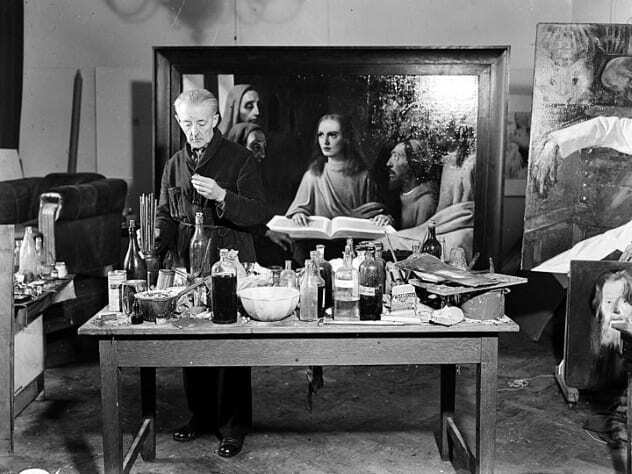 Shortly after the end of World War II Van Meegeren was arrested for treason because he had sold a priceless Vermeer to Nazi leader Hermann Goering. Van Meegeren’s only defence was to admit his work was in fact a forgery. The scandal was enormous and Van Meegeren became famous overnight; not only as the world’s greatest art forger, but also as “the man who swindled Goering”. In November 1947 he was finally convicted of obtaining money by deception and sentenced to one year’s imprisonment. Van Meegeren never served out his sentence as he died just a few weeks later in December 1947. This is Van Meegeren’s best known forgery. At its so-called discovery experts were tripping over themselves in praise of the work, which was assumed to be a genuine Vermeer. Museum Boijmans paid the huge sum of 520,000 Dutch guilders for its acquisition. Van Meegeren skillfully applied several aging techniques to give the painting a 17th century look and feel. The light entering from the left and the faces of the figures are all typical Vermeer. It is assumed that Van Meegeren’s wife modelled for all figures. The composition is clearly inspired by Caravaggio’s depiction of the story.